Tanuki, which means Japanese Racoon, has recently been opened by the same people behind the Standing Sushi Bar. The place is an 80-seater martini and raw food bar in Orchard Central where they challenged the Spanish Tapas by serving Japanese small plates. Menu consists of creative style sushi, fried food and sashimi and yes, many are raw like the steak tartare. Speaking of Raw food, what else but the all-time Singaporean favourite oyster? Going for $1 (max of 12 pieces) with any alcoholic drink during the happy hour from 5pm-8pm daily including weekends, the medium-sized Hiroshima oyster might not be the biggest ones you've had in your life but fresh and perfect for any oyster addict. Our alcohol to go with the oysters was Singapore Sling, a mixture of gin, cherry and pineapple ($11 at Happy hour). There is also the choice of Martinis and other classic cocktails. Our oyster hunter achieved a personal record of 16 oysters that day. A check with the Tanuki staff revealed that the saltiness in the France oysters come from the natural brine when they are shucked without any washing as some customers enjoy the mild savoury taste. The Chef's choice of Sashimi Platter ($38) might seem like the typical predictable Japanese fare but there are items like the stuffed ika(squid) which was not something quite common. Not really a fan of raw food like me? Try the Rockster roll($10): seared salmon draped with the pink Mentaiko(cod fish roe) sauce with mozzarella cubes in the centre. While the mozzarella might not be hot and melty, rest assure that this savoury sushi will not leave you with a salt overdose. The Urbane Plates are recommended for sharing but if you like to try a bit here and there, this platter of three plates:Tanuki Balls, American Roll and Edamame Egg roll ($26) is pretty ideal. As truffled beef carparcio over deep fried cheese potato, these Tanuki balls might be tastier with more dark brown base dressing which resembled the Okonomiyaki sauce. The cheddar cheese was nowhere found in this American roll but the sliced beef in the centre was sweet and resembles a remix Yoshinoya beef bowl, hyped up with yellow mustard, mayo and ketchup. But the Edamame Egg roll, a spring roll of minced Edamame and eggs was not particularly shining as the pastry skin had lost its crunch and the filling could do with more salt. In short, the oysters here are a steal and the Japanese fusion fare are worth a try though I would prefer if they could served the dons without the rice to boost it's menu selection( ie having the panfried Teriyaki chicken of the Yakitori Don without the rice, of course then the word Don must be altered). Service was prompt and fast on a weekend happy hour. But it is still unpredictable whether the place might get crowded when more people come here for their oyster + alcohol fix! 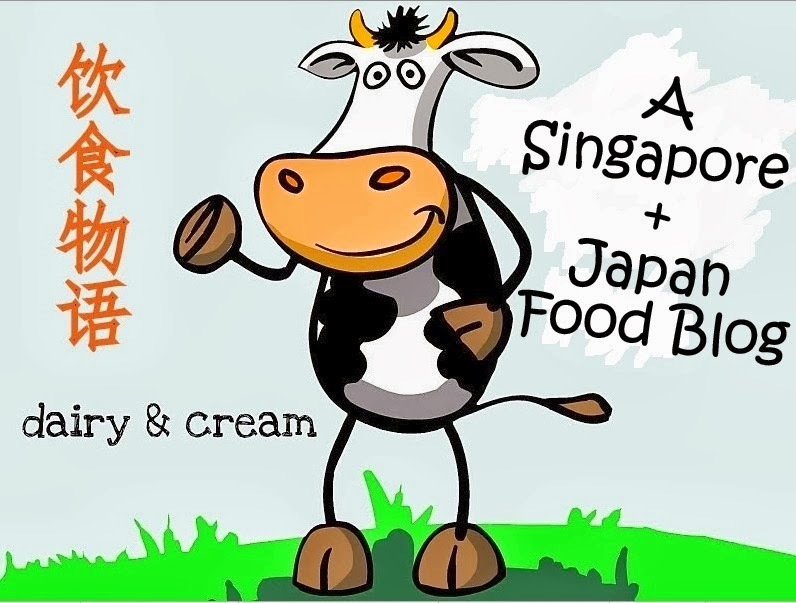 Please click "Like" on the Facebook Page : https://www.facebook.com/DairyandCream for latest updates and new posts! Ryoshi Sushi Ikekemaru is a family-style sushi restaurant at Liang Court that serves affordable sushi similar to Itacho Sushi. If my guess is correct, it is the exact sushi shop from Shizuoka (Click here for 沼津の回転寿司活けいけ丸 )The space where Ryoshi now stands used to change tenants a lot but I guess the business here is so good that it is going to stay for long. Ranging from $1.80-$6.80 per plate, the menu items are labeled with three different tags: お勧め(Recommended) , 人気(Popular) and お子様におすすめ (Recommended for children). The Jizakama Rayu (fish seasoned in chilli oil) is as mild as it looks while the Fuwafuwa Tamago is creamy but bland. I guessed we were in better luck when we ordered the recommended items like the Nama Shirasu ($5.80). The overflowing amount of raw whitebait was a pleasant sight that no one would complain that it's too much. But the large piece of eel in Daimyo Anago($5.80) shown below failed to impress the eyes and the taste buds. It needs more sun-tanning. Nama Sakura Ebi (raw cherry shrimps) $6.80 were soft,chewy but not much sweetness. Would prefer the shrimps to be stir fried with garlic and oil to bring out the fragrance instead of raw. But guess its a personal preference. Notice the absence of raw fish? That is because we prefer to have it as plain sashimi but they did not have it. Nonetheless, this did not disappoint as their non-sushi items were actually tastier! Salmon salad ($8.60) is drizzled in bright and tangy dressing while the Fried Oysters ($6.80) are plump, juicy and cheap. But it would be pity if you leave this place without trying their Raw Oyster in Ponzu Sauce. At $8.60, you get 4 medium-sized Hiroshima oysters swimming in a nice dish that is shaped like oyster shell! The Pumpkin Croquette $4.80 was another of our hot favourite because it was not simply puréed pumpkin but also contain pumpkin bits. Served piping hot, they did require some self-discipline to not bite into them immediately but worth the wait. For those who are not in a "sushi mood", this Tempura udon $9.60 serves as a decent choice. It is a set consisting of deep-fried prawn and vegetables with noodles that are thinner than usual udon. Overall, I prefer the non-sushi items even though this place specialises in sushi. Service is prompt and you may wish to take counter seats to view the sushi chefs in live action. Otherwise, the usual tables are good for families and friends to sit back and slowly enjoy the food. Morganfield's, the famous American ribs opened its first outlet at Star Vista last year. Since their ribs are so famous, we can't afford to give this miss. You may laugh but this Couple Platter combo $49.90 (for 2 pax) was more than enough to feed my family of four. For the choice of 2 types of ribs, we had the Signature Hickory BBQ Spare Ribs and their latest flavor Honey Rum Short Ribs. After hours of braising, chilling before being char-broiled, their signature sticky bones is undoubtedly tender, succulent and the smokey sauce blended well with the ribs. But their latest flavour deserves attention. Made with Sticky honey, juicy pineapple and Bacardi rum, this special sticky-sweet BBQ sauce does not dry out on the surface. Hence, one can still enjoy the sauce in every meaty bite. This was a refreshing alternative to typical heavy-weight ribs. For their side dishes, the butter corn was fresh, sweet and juicy but the Red Skin Mashed Potato with Ham was dry and rough. A dark-horse appetizer was this Sautéed Mushrooms that sounds plain but turns out amazing. Topped with Parmesan cheese powder, the King Mushrooms sautéed with Merlot Wine-infused garlic butter was so fragrant and al dente, that you may just stare at the dish in disbelief. Although some might think that their desserts were nothing to shout for, this Molten Chocolate Lava cake (free for Couple combo/$13.90 ala carte) outshines those served in petite sizes at fine-dining places. Just look at how much the intensely bittersweet lava flows out smoothly from the centre. It was my ideal ratio of lava to cake because it is always a problem when the sauce is wiped out faster than the cake. Fortunately, this is not the case.The light, soft pillowy texture of the cake section is a bonus. Service was friendly and portions were big. Unless you have a ravenous appetite, it may be better to come here with friends or families so as to attack the combo platters which will definitely save you some bucks...and an over-stuffed stomach. Having always been a supporter of Hakka style Ampang Yong Tau Foo, the mention of Simpang Niang Tofu on Channel 5 Makan Places Lost and Found 4 caught my attention and I decided to try it out. According to their website, it was established in 2000 at Bedok market place. Since that location was commonly known as "Simpang Bedok", the food was named as "Simpang Yong Tau Foo"
So, the Simpang Niang Tofu ($4/pax) is actually cooked in the Gong Bao Style but turns out to be not spicy at all. The gravy is darker, slightly sweeter and more fragrant since it has been infused with dried chilli. Another difference is that all the ingredients have been deep- fried, so you can't miss that crunchy chewy bite in each nugget of either wonton/fish ball/stuffed green pepper etc....The pieces are made smaller than the usual size and cut into half, and thus more convenient for diners. Their Kang Kong relied on a lot of hae bee but still leaned more towards the sweet side and lacked the spicy kick. Another of my favourite is their Signature Deep-fried Pork Knuckles aka Ter Kah $16 served with sweet chilli sauce. The uncle makes sure that the meat are sliced off from the bone when served so that diners won't have to mangle with the knuckle. As the Ter Kah is stewed before being deep-fried, each slice is consistently crispy, crunchy and absolutely non-greasy. Actually, there are a few zi char stalls with excellent pork knuckles and they are as tasty as or even tastier than German Pork knuckles. Their Assam Fish Head $22 is huge. The fish head was submerged in a sea of red orange gravy that is thicker, slightly sweeter than the usual ones. The tartness of tomatoes which complements the Assam flavor makes this an appetizing dish. However, the fish was not very fresh. Lastly, the fried bee hoon $5 came with more ingredients than the beehoon. It was definitely more than enough to go around since there were already other "main courses". This place located in Bedok can be quite far for some people but it is definitely worth making the trip down for their Yong Tau Foo and Pork Kuckles! Service is pretty fast and before you know it, the entire table will be laid with all the yummy dishes! Onaka first caught my attention because it means "stomach" in Japanese so why would anyone want to name their restaurant this way? Well, it turned out that this name stands for Optimum Nutrition And Kitchen Arts. What draws me here the most is that the place offers a nutritious and tasty menu catering to different dietary needs: Dairy-free, Egg-free, Gluten-free, Vegan, Vegetarian. Our appetizer was the Asian Hummus ($8) -- a blend of organic chickpeas, tahini, topped with chilli-marinated olives. The dip which was fortunately served at room temperature and thus had a good creamy texture. But it would have be a delightful dish if the whole meal pitas weren't as hard as crab shells. Dairy-free, Egg-free, Gluten-free, Vegan, Vegetarian. Looked like satay? These are Soy Melange $10: mixture of two types of soy, tofu and tempeh. Tempeh, as fermented soybean product, has a unique chewy texture that sits between Chinese tofu and steamed yam. Dip them into the kecap manis sauce for the extra mild umami taste. For the mains, would you be surprised if the Chilli Crab Cakes $24 come in three big fat lemongrass skewers? The chilli sauce version is thicker, sweeter and not as spicy as compared to the zichar style. The texture is similar to Thai fish cakes that are not deep fried. The Organic Rice cubes drowned by the sauce tasted like a hybrid of ketupat and nasi-lemak. The rice had a sticky texture but gives out with whiffs of coconut fragrance. As fish-lovers, how could we miss the Pear and Salmon $20? The 47degree seared salmon was moist, soft and lubricated with the soft poached egg. The julienned Asian pear is rarely paired with fish but turns out well as it adds a refreshing fruity flavor and crunch to the dish. Although the Modernist Chicken Curry $25 is dairy free and egg free, the gravy was still thick and creamy as it was blended with sweet potato. The corn-fed, free range, hormone-free chicken tasted so different from the usual chicken and I wonder if this should actually be how chicken tasted like. It did not appear very modernist to me and could be spicier. Similarly, the flavors seemed too conservative in this hot and sour prawn rice noodles $18. The noodles were springy but there were not enough broth of shrimps, herbs and lime to go with the starch. For desserts, go for the avo-choco emotion $12 . The avocado mousse did not had an overpowering vegetable smell and complemented with the airy, lightly-sweetened chocolate layer. Not too creamy and thus a good end for the meal. However, the yoghurt chocolate parfait $9 which I had mistaken to be tiramisu ( this was from the display cake selection) turned out to be rather lacklustre. Perhaps the lack or minimal use of cream resulted in thick layers of chocolate bricks which even a strong man had difficulty breaking through with a spoon. Fortunately, this banana pastillas (vegan)$10 saved the earlier parfait. The puff pastry filled with cinammon-roasted bananas, walnuts were "air-fry" together, which I supposed no oil is used. Drizzled with caramel sauce and eaten together with cardamom banana ice cream, this hot-cold dessert was no less sinful than goreng pisang but tasted amazing. While Goodwood Park may be famous for their durians, do you know that they sell pastries and bread too? Occasionally, I do make trips down to the Deli shops to check out if there is any new items and most likely I would not go back empty handed. Have you tried cakes with lemongrass before? Macarons and plated desserts perhaps but it is not very commonly found in cakes like this Chocolate Lemongrass Slice ($8++). The taste of lemongrass in the yellow layer was distinct but did not overpower the light milk chocolate mousse. Coated in dark chocolate ganache, this cake reminded me strangely of Thai Tom yam soup. The Vanilla Raspberry Charlotte $6.80++ (above) is a creamy vanilla mousse layer which sat on top three Swiss rolls that are filled with raspberry jam. The mousse layer was faultless but the rolls at the base were a little too sweet. Meanwhile, the Chocolate Apple roll $7.80++ (below) is a dry layer of almond- studded sponge cake stuffed with green apple cubes & choc mousse that is denser than the lemongrass cake(top). Perhaps the chef did not bring out the green apple flavour to the fullest and it became rather discordant with the dark chocolate. I thought the Chocolate Vanilla Tart $6.80++ would just be vanilla cream on top of an all dark chocolate tart. It was later that I realized that it was filled with sweet custard topped with chocolate ganache. The fillings were velvety and rich but the thin crust had turned soggy unfortunately. Nonetheless, I really appreciate the consistency of the overall cake quality and also how the chefs make an effort to change the items every month. The cakes here range from $6-$8 and they are definitely cheaper than the average petit slices from Canele, Antoinette and TWG. Besides cakes, they also sell yummy beef, chicken, mushroom pies and assorted bread. Now that you have read this, i hope you won't be think of only durians when you see "Goodwood" .